Jimmy Buffett translated his easygoing Gulf Coast persona into more than just a successful recording career — he expanded into clothing, nightclubs, and literature. But the basis of the business empire that keeps him on the Fortune magazine list of highest-earning entertainers is his music. Buffett moved to Nashville to try to make it in country music in the late ’60s. Signed to Barnaby, he released one album, Down to Earth (1970), from which the socially conscious single “The Christian?” suggested he might be more at home protesting in Greenwich Village. (Barnaby “lost” his second album, High Cumberland Jubilee, though they would find it and release it after he became successful.) Instead, he moved to Key West, FL, where he gradually evolved into the beach-bum character and developed the tropical folk-rock style that would endear him to millions. Signing to ABC-Dunhill Record (later absorbed by MCA), Buffett achieved notoriety but not much else with his second (released) album, White Sport Coat and a Pink Crustacean (1973), which featured a song called “Why Don’t We Get Drunk”. Buffett revealed a more thoughtful side on Living and Dying in 3/4 Time (1974), with its song of marital separation “Come Monday,” his first singles-chart entry. But it took the Top Ten song “Margaritaville” and the album in which it was featured, Changes in Latitudes, Changes in Attitudes (1977), to capture Buffett’s tropical world view and, for a while, turn him into a pop star. By the start of the ’80s, Buffett’s yearly albums had stopped going gold, and he briefly tried the country market again. But by the middle of the decade, it was his yearly summer tours that were filling his bank account, as a steadily growing core of Sun Belt fans he dubbed “Parrotheads” made his concerts into Mardi Gras-like affairs. 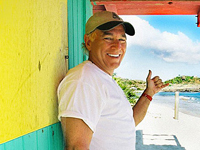 Buffett launched his Margaritaville line of clothes and opened the first of his Margaritaville clubs in Key West. He also turned to fiction writing, landing on the book bestseller lists. His recording career, meanwhile, languished, though a hits compilation sold millions; a 1990 live album, Feeding Frenzy, went gold; and a 1992 box-set retrospective, Boats, Beaches, Bars, and Ballads, became one of the best-selling box sets ever. Buffett finally got around to making a new album in 1994, when Fruitcakes became one of his fastest-selling records. It was followed in 1995 by Barometer Soup and Banana Wind in 1996. The following year, Buffett began working on a musical adaptation of Herman Wouk’s novel Don’t Stop the Carnival with the author himself. After Broadway producers expressed little interest, the production ran for six weeks in Miami during 1997. In spring of 1998, Buffett released a collection of songs from the production as he began mulling over the idea of taking the play on the road. In 1999 he released Beach House on the Moon as well as Live: Tuesday/Thursday/Saturday.